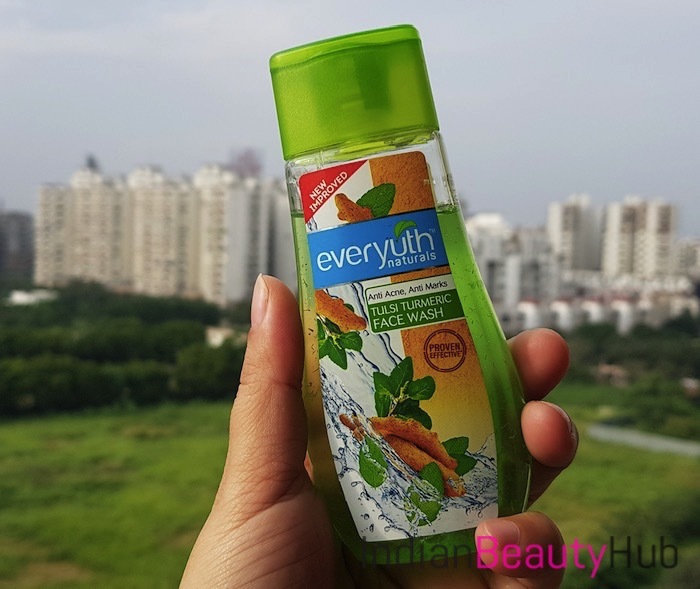 Hello everyone, today I am reviewing the Everyuth Anti-Acne Anti Marks Tulsi Turmeric face wash. It is enriched with neem and turmeric that are known from ages for the healing and antibacterial properties. It is not a newly launched product however they’ve improved the formulation and revamped its packaging. 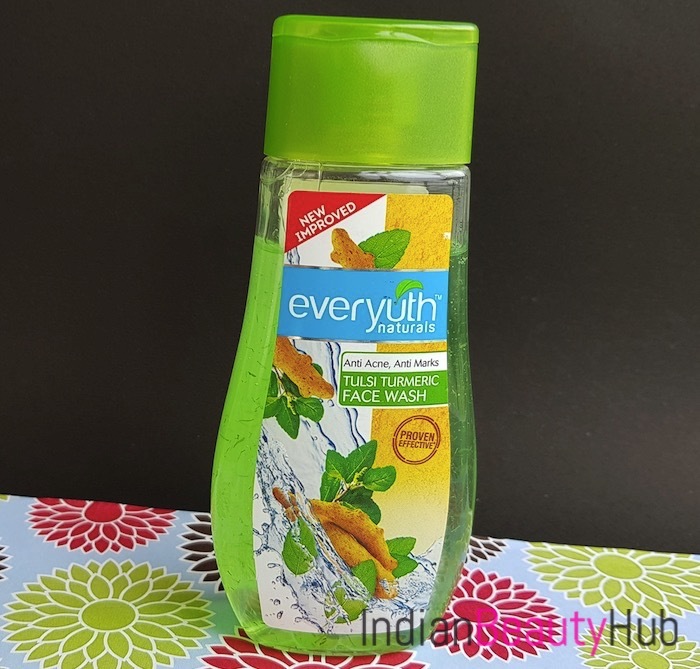 The price of the Everyuth Tulsi Turmeric face wash is Rs.84 for 100g, and it is readily available at local beauty and departmental stores. 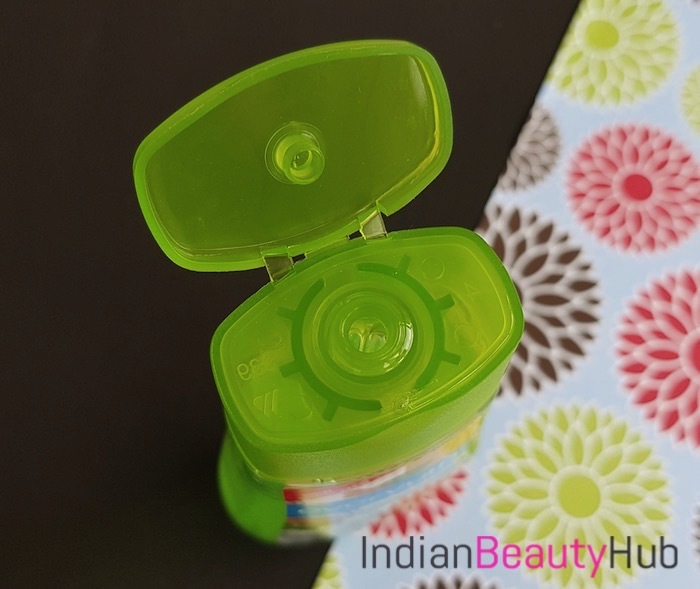 My Experience: The face wash comes in a light green gel form and contains loads of thin green strands. It produces a rich lather and removes dirt and oil from the skin efficiently. It washes off thoroughly with a few splashes of water without leaving a greasy feeling. After every usage of this face wash, my skin feels clean, oil-free and fresh. 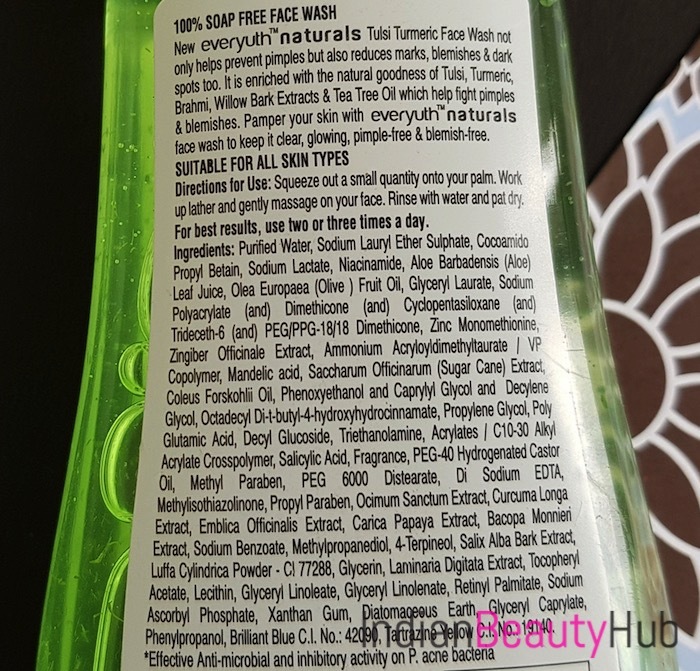 I have combination skin with pimples, acne marks and blemishes and after trying this face wash for over a month, I’ve not seen any improvement in my skin condition. In my opinion, it is just an average face wash that cleanses the skin nicely without providing any added benefit. A gel-based face wash that cleanses the skin thoroughly. It is enriched with the extracts of tulsi, turmeric and tea tree oil. It comes in a compact, spill-proof bottle packaging with an open flip cap. It didn’t cause any allergy or irritation to my acne prone combination skin. Widely available at local stores as well as online shopping sites. Not true to its claims of preventing acne and removing dark spots. It can leave the skin dry and stretchy that makes it inappropriate for people with normal to dry skin. It has a weird scent. Enriched with the natural goodness of Tulsi, Turmeric, Brahmi, Willow Bark Extracts & Tea Tree Oil. It not only helps prevent pimples but also reduces marks, blemishes & dark spots too. Overall, it is a mild gel-based face cleanser that removes skin impurities leaving the skin clean and soft. If you are looking for an affordable face wash with natural extracts, then you can consider buying it. However, don't expect it to prevent pimples or acne.